The game's menus are clean, well-labeled, and have sufficient buffer space between tappable options. Unlike SBK: Snowboard Kids, Shaun White Snowboarding used a revolutionary touch screen control system. The control system does take some getting used to early on, but once you've learned it, basic movement using the touch screen is easier than remembering several button controls. The tricks are more difficult, but ultimately not an essential tool in Single-Card Download's racing mode. The touch screen is very reactive in telling you what your motions are doing, but that can cause you to take your eyes off the upper screen at a bad time. This can get annoying while learning the controls early on, but there isn't a better alternative (at least that I can think of). Once you've learned the controls, they'll likely become an afterthought that you'll perform automatically. Graphically, Shaun White Snowboarding exhibits an excelent 3D look (not perfect, but excellent). The graphics give a good sense of depth (oncoming rails/barriers, curves in the path, etc.). Sound is limited to sound effects (no music) for both players, which benefits smack talk. There are no selectable features. On a personal note, I've reviewed a lot of games that have had bad, obnoxious, annoying, or even deal-breaking music. I don't personally find having no music to be a bad thing (no sound is a bad thing, but not necessarily no music). For a given game, I'd much rather have sound effects only with no music that I would bad music. This is especially true in sports titles, most of which can provide sufficient sound effects. When people play sports in real life, there's often no music playing (announcing, yes, but rarely music). I think of it like one of the timeless golden rule quotes: "If you don't have anything nice to play, don't play anything at all" (you know the one). Now, I'm not making a judgement about the musical selections in the main game (which I don't review here), but after filling every bit of available internal storage with gameplay, forcing music in would likely result in the music sounding like... well... stinky poop, to be kind. In summary: I like the decision. Shaun White Snowboarding's Single-Card Download content is, indeed, fun: it's a downhill snowboarding race that involves steering around obstacles and navagating rails and barriers. The question in this case, though, is how the fun balances with the timing and the gameplay. Timing-wise, I was extremely diappointed to find out the the time required to download the game was two to three times as long as the race itself. If you race a few times, however, it balances (especially if you can otherwise occupy yourself during the download). Gameplay-wise, your ability will go from "learing the basics" to "infinitely fine-tuning" after two or three races. I don't think Shaun White Snowboarding's Single-Card Download gameplay is as fun as SBK: Snowboar Kids' Single-Card Download gameplay (SBK allows up to 4 players with a quicker download and the ability to attack other racers), but I think both are fun. Unquestionably, Shaun White Snowboarding provides a more realistic snowboarding experience and one that is comparisons aside, fun. Speed up the download process!!! Allow up to three guests at a time (instead of just one). Offer a second racing trail to choose from. 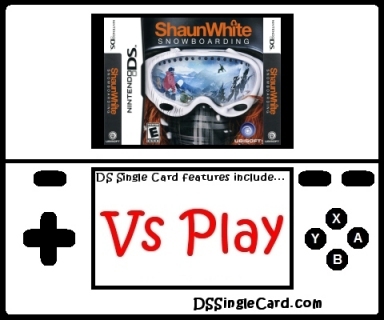 Click here to return to the DSSingleCard.com Shaun White Snowboarding profile.